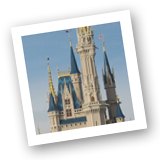 It is no surprise that Walt Disney World is the most visited vacation spot in the entire world. It has amazing attractions and shows, first class resorts, and customer service that is second to none. Most people would agree that the overall experience of a Disney vacation is very enjoyable. However, we could also agree that the one part about visiting the theme parks that isn't always fun is waiting in long lines. This is especially true when the temperature is 95 degrees with 100 percent humidity, which is not uncommon in the summer months. Disney continues to do a great job of making lines more entertaining to help us forget how long we are waiting. In just the past three months they have added interactive queues at both The Many Adventures of Winnie the Pooh and The Haunted Mansion. I certainly recommend taking your time to enjoy these new additions at least once. However, wouldn't it be nice if there was a way to avoid most lines, especially when it is hotter than the surface of the sun and junior is having a meltdown as there are still 200 guests in front of you waiting to board Dumbo? Thats where the "Lines" app comes in! "Lines" is truly a fantastic app that gives you accurate wait times for every attraction in Walt Disney World. It was created by the folks at TouringPlans.com (check out the article #13 that I wrote about this site back in February of this year). The information that "Lines" provides comes from two sources. First, the staff at TouringPlans.com did extensive research and compiled years of historical data to come up with estimates of what the wait times should be for any given attraction at any given time. They have designed mathematical logarithms that are well beyond my comprehension. In addition to these estimates, they also get "real time" figures from guests in the parks who input the wait times on their smart phones. Using these two sources of data, the "Lines" app does a remarkable job of keeping us informed. This is a prime example of how modern technology can assist us in enjoying the vacation kingdom. In addition to current wait times, "Lines" also gives estimates of what to expect for the rest of the day. This can greatly help in planning out your your strategy to visit the most attractions possible. Not only do you get wait times with this app, but you also get FASTPASS information. It will let you know the approximate return times if you were to pick up a FASTPASS at that moment. Again, this is super helpful information to get the most out of touring a Disney Park, especially on a crowded day. Phone specific versions of the "Lines" app are available for the iPhone, Blackberry, and Android devices. However, you can also access it through a mobile website which can be used on virtually ANY smart phone. In order to access all of the features of the app, you are required to have a TouringPlans subscription. It is $10.95 for a full year and it is worth every penny. I used this app on my recent trip to Walt Disney World and it worked like a charm. I don't think I waited in line at any attraction for more than 15 minutes! When you are spending thousands on a Disney vacation, this extra $10.95 is a no brainer. You also get full access to the TouringPlans.com crowd calendars and touring plans. I highly recommend both TouringPlans.com and the "Lines" app. They will simply make your vacation more enjoyable! Walt Disney World is the most photographed destination on the planet. As many as 200,000 photos are taken per day by Disney PhotoPass photographers alone. My wife would argue that I actually take more than that when we visit the vacation kingdom, but that is a discussion for another day. With all of the pictures that are taken, it stands to reason that there would also be quite a bit of video footage recorded. There is no better proof of this than YouTube. For anyone who has just returned from being on a deserted island for the last decade, I will give a very brief description of what YouTube is all about. Simply put, YouTube allows users to "upload" video clips to the internet for all the world to view. These videos can be home movies that Uncle Bob took or they can be very high quality clips that were created by well known companies and organizations. The bottom line is that you can search just about any subject and find a related video on YouTube. You can access YouTube by going right to YouTube.com. When it comes to Walt Disney World, there are literally thousands of videos to be found on YouTube. They range from typical home movies to professional productions. You can find complete attraction "ride alongs" as well as entire stage shows and fireworks displays. You simply type in the name of a ride or show and there will be a list of videos to choose from. 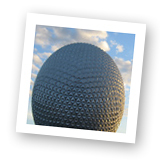 Not only will you find videos from the Disney parks, but you can also find recordings of each and every resort hotel. This is a great tool when you are trying to decide where to book your next room, especially if you have never visited a particular resort. YouTube is one of the best and easiest ways to use modern technology to stay connected to Walt Disney World. It can be accessed from any computer in addition to just about any smart phone available today. The next time you are daydreaming about a Disney World vacation, you can simply type in your favorite attraction and watch a little clip of the magic. It certainly won't be the same as enjoying Rock n' Roller Coaster or Peter Pan's Flight in person, but it will take your mind off of the cold and icy weather that we deal with in the Northeast for the better part of six months. This YouTube technique is a wonderful little escape. I know this from first hand experience! One of the questions people often ask me is how to save money on a Walt Disney World vacation. I will typically talk about going during "value" seasons or at times when Disney is offering the free dining plan. I will also discuss inexpensive restaurants or how to maximize your use of the Disney World transportation system to avoid spending money on a rental car. However, these are only a few of the ways to keep your costs down. I have recently come across an amazing website that provides us with a very comprehensive and current way to save while on a Disney vacation. It is called MouseSavers.com. MouseSavers.com has been around for about ten years and is an extremely popular site. It is hard to believe that I hadn't come across it sooner. Although Walt Disney World is at the top of the list of discounts, the site also covers ways to save money at Disneyland and on the Disney Cruise Line. In addition to saving money on a Disney vacation, it includes information on finding the lowest airfare, rental car prices and even non-Disney theme parks and attractions. In a nutshell, using MouseSavers.com is like consulting with a completely free travel planner who will help you stay within your budget and find you the best possible deals. When it comes to saving money at Walt Disney World, MouseSavers.com covers it all. You will learn the best times to book your vacation for maximum resort savings to specific ways to get reduced rates on park tickets. All of the research has been done for you to make your decisions easy. For example, you might be a AAA member with an annual pass who is also a member of the military. You would have three potential ways to save some bucks, each one giving you a percentage of savings. You simply choose the best discount available. In addition to specific discounts, MouseSavers.com is full of tips and advice to save you money. They give you great ways to keep your meal costs down as well as ways to save money on souvenirs. This site even talks about ways to maximize your time while touring the parks, which in turn allows you to see more while spending less. MouseSavers.com was founded and continues to be run by Mary Waring. She gets over 3 million page views per month, maintains a newsletter mailing list of over 326,000 subscribers, and has a Facebook page with over 48,000 likes. There is a good reason for its popularity. There is simply no other website that is as informative on how to save money on a Disney vacation. I am a veteran of close to thirty Disney World trips and I'm simply amazed at the number of discounts and deals available that I never knew about. I won't plan another trip without consulting MouseSavers.com. Today we say happy birthday to Test Track, which officially opened on March 17, 1999 at Epcot. There were "soft" openings as early as Christmas in 1998, but it wasn't until St. Patricks Day of the following year that it saw its grand opening. This attraction has the distinction of being the fastest ride ever built for a Disney park. Yes, it is actually a little faster than Rock 'n' Roller Coaster over at Hollywood Studios. For those of you who haven't had the opportunity to ride Test Track, it is a one-of-a-kind attraction that takes guests through a series of tests to show how new automobiles are evaluated on everything from brakes, to handling, to extreme temperatures. 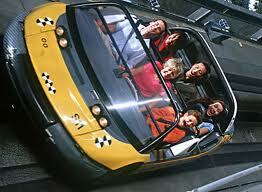 The ride vehicles are rather futuristic, electrically powered automobiles that carry six passengers seated in two rows. It is a very entertaining attraction that lasts a little over five minutes. However, it is in the final thirty seconds that guests get to experience the real thrill which takes them outside of the attraction building. The cars accelerate up to sixty-five miles an hour at this point. Now, most people who haven't ridden Test Track say that they drive sixty-five in their cars every day and can't imagine how this would be exciting. They usually change their tune after experiencing the "convertible" ride vehicles quickly accelerating as they travel through the 50 degree banked curve that is part of the outdoor track! Test Track was initially scheduled to open in May of 1997 but due to issues that came up during testing, it was delayed nearly two years. It took almost three full years to complete the project from start to finish. A fact that I find interesting is that the ride remains powered up for 20 or more hours per day, due to the enormous amount of nightly maintenance and lengthy start up times. Test Track is housed in the former home of the World of Motion which opened with the park in 1982 and closed on January 2, 1996. This attraction was a favorite of my family and we would make sure to ride it on every trip to Walt Disney World. It was a lighthearted look at the history of transportation that took riders on a slow journey through scenes from the invention of the wheel through the present day. 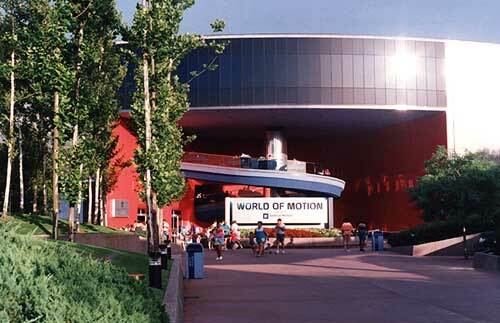 Although World of Motion is missed by Disney World nostalgics, including myself, it was definitely time for a "thrill ride" to be built at Epcot. Test Track filled that void and continues to be one of the most popular attractions at any Disney park. As most of you know, the Walt Disney World online community of fans has grown tremendously over the past five years. Literally thousands of enthusiasts listen to podcasts, read the blogs and visit countless websites dedicated to the subject of the world's most visited destination. There are a handful of leaders in this group and at the top of the list has to be Lou Mongello. This is a man who's boundless energy and passion for all things Disney World is inspirational to those of us who admire his work. Lou is the author of the Walt Disney World Trivia Books, the host of the WDW Radio Podcast (which I wrote about in my very first article), and the publisher of Celebrations Magazine. He is also the writer, narrator and producer of the Audio Guides to Walt Disney World which I am featuring in this article. The Audio Guides to Walt Disney World are a unique and very interesting way to learn about the vacation kingdom. 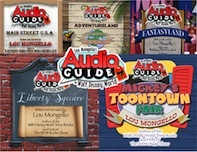 So far Lou has created five Magic Kingdom audio guides which are available on CD or digital download. Currently available are Main Street, USA, Adventureland, Fantasyland, Liberty Square and Mickey's Toontown Fair. Each Audio Guide contains over an hour of fascinating information including the details and history of each land. The Audio Guides are all narrated by Lou himself and contain ambient background audio appropriate to whatever he is describing at the time. He takes you on a virtual tour of each land and you actually feel like you are strolling through the Magic Kingdom with him. Although they can be enjoyed anywhere, Lou did such a masterful job at producing each guide that you can physically walk through the park while listening to his descriptions on your iPod or iPhone. Most attractions, shops and restaurants have their own dedicated tracks allowing you to quickly find what you want to learn about. Similar to the term often used to describe EPCOT, I don't think it is a stretch to refer to the Audio Guides to Walt Disney World as "edutainment." Lou certainly knows how to entertain his audience while enlightening us along the way. The Audio Guides are an ongoing project for Lou. He is currently working on the final two lands in the Magic Kingdom and hopes to move on to the other parks in the future. All five of the current "albums" are available here as well as on iTunes. They are very inexpensive and worth every penny! 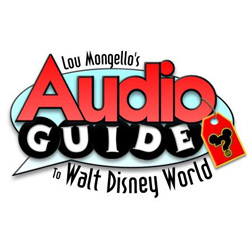 As a Disney World fan, I can't recommend Lou's Audio Guides highly enough. After listening to all five of the guides several times, it is hard to believe that they weren't actually produced by the Disney company. In wrapping up this article, I just wanted to mention a few more things about Lou Mongello. Although I haven't had the pleasure of meeting him yet, I feel like I've known him for years. In listening to his podcasts each week, I've gained a high level of respect and admiration for what Lou does. His passion and dedication show in all of his different endeavors. What I find most admirable are his fund raising efforts for his charity that helps send sick children and their families to Walt Disney World. As we say in the Disney community, Lou Mongello "gets it" and is one of the best at what he does. 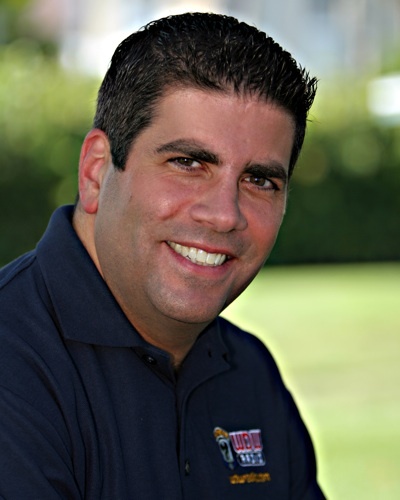 To learn more about Lou, visit his website at wdwradio.com. Have a Disneyriffic day and remember to keep moving forward. As many of you know, photography is a hobby of mine. My dad was at one time a professional wedding photographer and my siblings and I were born with the photography "bug." Family gatherings tend to resemble press conferences with the constant flashes and my wife refers to my camera as the "other woman." Needless to say, I enjoy snapping pictures and I currently have just under 30,000 digital photos saved on my computer, all taken since 2002. Something else that should come as no surprise is that well over 10% of my pictures were shot at Walt Disney World. I assumed that I had one of the larger collection of Disney World photos until I came across WDWmemories.com. This is a website that is solely dedicated to providing the world with high quality photos of Walt Disney World. There are currently over 6,000 pictures on the site and they are all free for non-commercial use. They are organized into five major categories including the Magic Kingdom, Epcot, Hollywood Studios, Animal Kingdom and Miscellaneous. The Miscellaneous section features galleries that include characters and resorts. WDWmemories.com is a fun place to visit when you are just in the mood to browse Disney World pictures. It is also the place to come if you're looking for a specific photo for a scrapbook, presentation or computer wallpaper. In addition to the ability to get free pictures for personal use, the owners of this website allow you to purchase exclusive rights to their photos for commercial use. This could come in handy for anyone in a travel related business who is putting together marketing materials. Although, I just recently came across WDWmemories.com, I am impressed with its content and certainly recommend that all Disney World fans check it out. 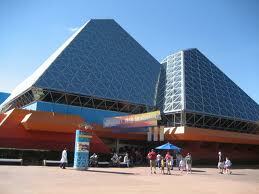 EPCOT Center opened on October 1, 1982 as the second major theme park at Walt Disney World. The Imagination Pavillion opened with the rest of the Future World section of the park and featured the 3-D movie Magic Journeys. It wasn't until the following March 5th that that the Journey Into Imagination ride debuted. This attraction was one of EPCOT Center's most popular and entertaining. Journey Into Imagination was an attraction for all ages, featuring slow moving ride vehicles in an experience where imagination was highlighted through visual arts, storytelling, and science. The main characters were Dreamfinder and his beloved little purple dragon, Figment. In the early years of EPCOT, when it was known as EPCOT Center, Dreamfinder and Figment were the character icons of the park. Disney didn't bring the "traditional" characters into EPCOT until many years later. There is an interesting story behind how the name Figment came about. The inspiration for the character came to Imagineer Tony Baxter while he was watching an episode of Magnum P.I. In Tony's words: "I remember the day that Figment came into being. I was watching a Magnum P.I. show on television and Higgins' garden was all torn up because Magnum had hidden a goat in the yard. When Higgins said that something was destroying his garden, Magnum said, 'Oh Higgins, it's just a Figment of your imagination.' Higgins looked at him and said, 'Figments don't eat grass!' And right then I thought about this character that everyone knows about and has never been visualized, so I came into work the next day and said, 'I've got the star of our show!" The original version of Journey Into Imagination closed in 1998 and reopened as Journey into YOUR Imagination on October 1, 1999. It featured an updated theme based on the 3-D movie Honey, I Shrunk the Audience. Now guests would take a tour of the "Imagination Institute" which would take them through numerous labs including Sound, Illusion, Color, Gravity and Connections. Although still an entertaining attraction, the new version did not include Dreamfinder and there were only a few cameos by Figment. Mosts guests missed the original Journey Into Imagination and the attraction closed in 2001 for another refurbishment. It reopened on June 2, 2002 and brought back Figment in a much more prominent role. Although it isn't anything like the original, this current version isn't bad and most guests are happy to see the return of the cute, little, purple dragon. Riding with my son on a recent trip! March 5, 1983 also has personal significance to me and my family. We were actually on a Walt Disney World vacation at that time. Unknowingly, we probably were among the first guests to actually ride Journey Into Imagination. I was eleven years old at the time, and this was the trip that started my obsession with the vacation kingdom. I have visited 25 times since then and look forward to going again as soon as possible. Thanks mom and dad for lighting that Disney spark and helping to create so many great family memories! For the first time on the Digital Disney World Blog I am actually going to highlight another blog. I am speaking of the Disney Parks Blog. This is the "official" blog of the Walt Disney World Resort, the Disneyland Resort, and the Disney Cruise Line. It is a great place to get up to date news about what is happening in each of these areas of the Disney Company. Although most of us are primarily focused on the Central Florida destination, it is fun to see what's going on at Disneyland and with the Magic, Wonder and new Dream cruise ships. The Disney Parks Blog was started back in the Fall of 2009. It seems that the unofficial Disney online community had grown to a point where it was time for Disney to get involved. The internet had become the primary way for fans of the mouse to communicate and it seems like everyone and their sister were starting websites, podcasts or blogs related to the subject. As they often do, Disney took note of what their adoring public was doing and started the official blog. It is simply an extension of the disneyparks.com website and you can get their by heading to disneyparks.com/blog. You can expect daily articles from actual Disney cast members who typically work in the public relations or social media departments. However, you will see postings from cast members from all different areas of the company. Most of what is written on the blog is accompanied by great pictures and, in some cases, high quality video. Like most blogs, Disney allows readers to leave comments on the articles. It is important to know that the comments are reviewed prior to posting so it is important to keep them relevant and appropriate. In addition to the current news and information, the site has an archive of all past articles. The archives are searchable by timeline, category and tags. You can also search by typing in keywords. The Disney Parks Blog has only been existence for about eighteen months but there are over 1,000 articles specifically related to Walt Disney World in the archives. It is fun to browse through past postings on this blog as well as stay up to date with all the current happenings at the parks and on the cruise line. Animal Kingdom opened on April 22, 1998. It was the largest Disney theme park in the world at over 500 acres, but there were still plans for expansion. The first major addition to the park happened 12 years ago today, on March 1, 1999 when the Asia area debuted. It included two new attractions as well as the already established Flights of Wonder show. The first new attraction that we are saying happy 12th birthday to is the Maharajah Jungle Trek. 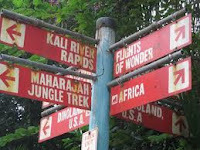 This walking trail leads guests through the forests and ruins outside the Disney created Asian village of Anandapur. It is an amazing series of natural habitats where you can see animals such as tigers, Komodo dragons and fruit bats. It is a self guided tour with Disney cast members stationed along the way to answer any questions and provide fun facts. Disney does an incredible job at getting you close to the animals while still preserving their surroundings and keeping you safe. This is especially prevalent in the bat "house." The only things between us and these relatively scary looking creatures are thin wooden poles placed about 6 to 8 inches apart! We are told by the educated sounding cast member that the bats' wing spans are so large that they could never fly between the poles. To my knowledge, there has never been a tourist attacked by a Disney fruit bat! 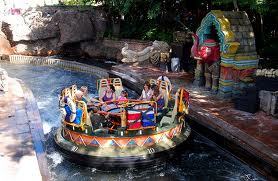 The second attraction that opened on March 1, 1999 is Kali River Rapids. This is an exciting 12 passenger raft ride through the rainforest on the Chakranadi River. As with every attraction at Disney World, this rapids ride has a story behind it. It starts in relatively calm waters showing you the beauty of the lush jungle complete with jasmine-scented mists. However, things take a turn for the worse as the water gets choppy and you come upon evidence that logging companies are threatening the wildlife and ruining the landscape. Kali River Rapids culminates with an exhilarating drop down a 30 foot waterfall. This attraction is great on those hot Florida afternoons because you WILL get wet. There is a pretty good chance that you'll get soaked! An interesting note about Kali River Rapids is that it was originally going to be called Tiger Rapids Run. The rafts were going to pass through the tiger enclosure so that guests could actually see the big cats while on the ride. However, animal behaviorists pointed out that screaming wet tourists would drive the tigers towards the back of their habitats and they would surely be out of site. 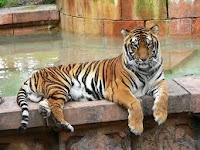 The Imagineers smartly decided to feature the tigers in the walk-thru Maharajah Jungle Trek instead. This is only my second O.T.D. - "On This Date" article on the Digital Disney World blog. It is actually the first one that is celebrating the anniversary of an opening in a Disney World park. I plan to continue to include these type of stories mixed in with the modern technology postings. I'd love to hear if you think the O.T.D. articles are interesting enough to keep writing. Thanks for the feedback!